Is there anything finer, more perfect than a ripe, ruby-red cherry? Sure, we all love succulent strawberries, plump blueberries and juicy raspberries, but nothing can rival a cherry, that bright red summery globe so beloved of birds and small children. Cherries have a long and tangled relationship with mankind (you could say it’s “complicated”). Cherries, both sweet and tart, seem to have originated in Asia Minor, somewhere in the region between the Black and Caspian Seas. 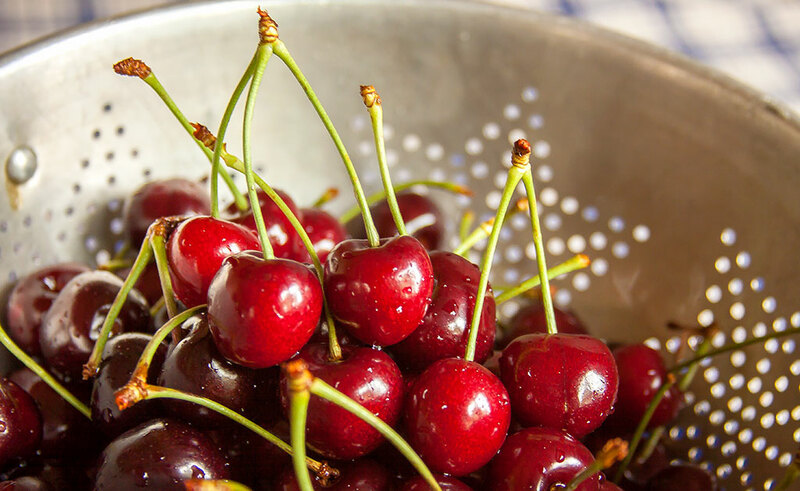 While they appear rather late in the historical record, cherries were probably cultivated by both the ancient Greeks and Chinese, and subsequently by the Romans who spread the fruit across much of Europe. Cherries came to North America with early English settlers, but modern cherry cultivation didn’t become widespread until the mid-1800s. In 1852, cherry trees were planted on Old Mission Peninsula near Traverse City, Michigan where they thrived. Within a few years, commercial cherry production in Michigan was in full swing. No wonder that Traverse City is still known as Cherry Capital, USA! Sweet cherries are most often eaten fresh, just as they are, and they are indeed wonderful without any adornments whatsoever. 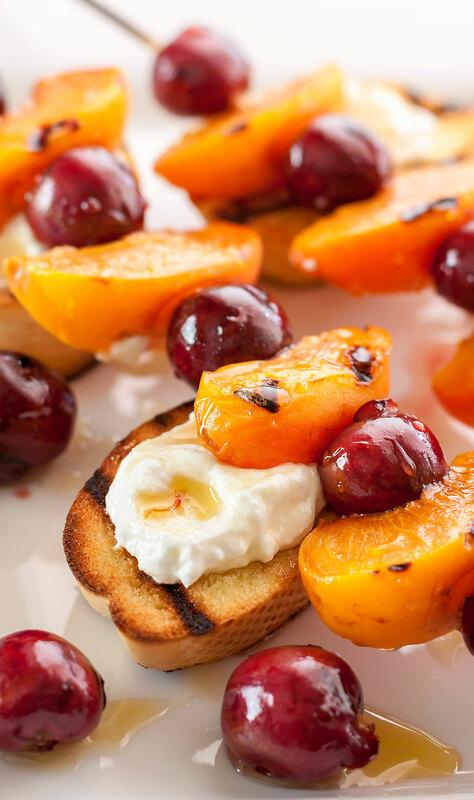 But in this interesting recipe, the flavors of fresh, ripe cherries and apricots are intensified by quickly grilling them over high heat, caramelizing some of their natural sugars and adding a mysterious touch of smokiness to the fruit. The tartness of thick, strained yogurt, balanced with the dusky sweetness of saffron-infused honey further enhances the wonderful sweet/tart flavor of one of the world’s favorite fruits – the beautiful, blushing sweet cherry. This preparation makes a delicious showcase for cherries and apricots, just as they reach the peak of the season. 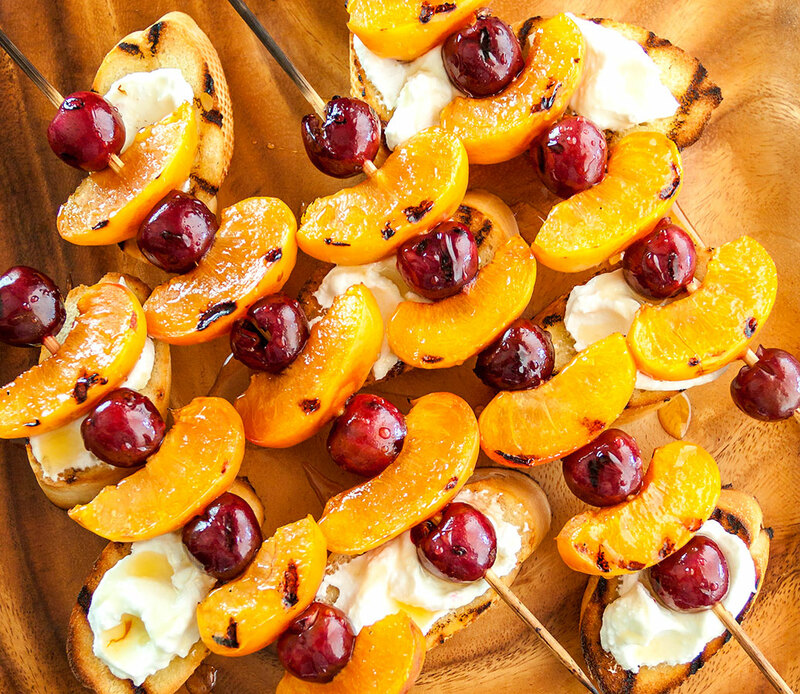 The unusual step of caramelizing the fruit on the grill intensifies its flavor while crisp grilled bread, slathered with thick yogurt cheese, soaks up the sweet juices and dripping honey. Preheat the grill to medium-high heat, making sure the grill is thoroughly preheated before you begin. Brush the bread slices on both sides with olive oil. Thread the fruit onto skewers and brush with olive oil on all sides. Grill the bread over high heat until lightly charred and crisp, about 30 seconds to 1 minute per side, depending on the heat of your grill. Grill the fruit skewers until lightly charred and just tender, about 1-2 minutes per side. Spread the yogurt cheese thickly on the grilled bread (halve each slice, if using larger than a baguette.) Transfer to a platter. 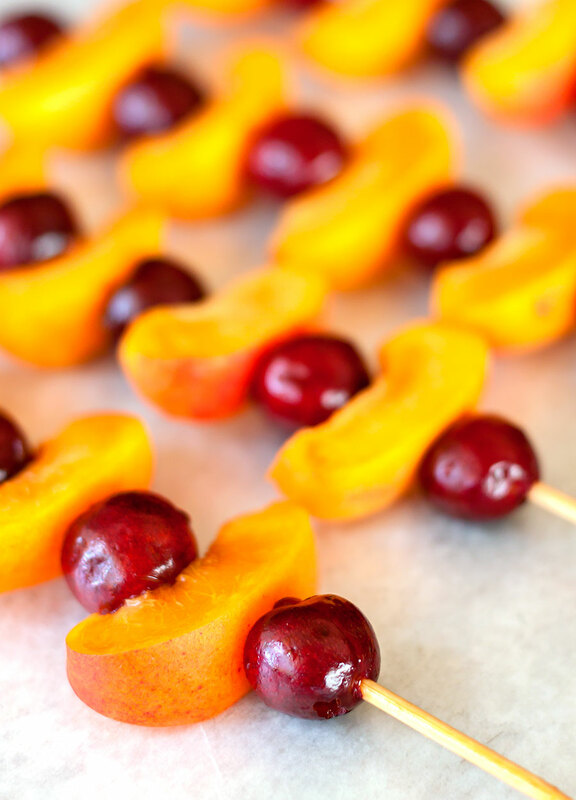 Slide the fruit off the skewers onto the bread, drizzle some of the saffron honey over the fruit and serve. Note: For a delicious twist on this recipe, serve the warm grilled fruit over ice cream instead of bread and yogurt cheese. Drizzle honey over the top to taste.